Dr. Wily finally concedes that Mega Man may be too much for his evil robotic creations. Determined to get the best of the blue bomber, Dr. Wily contacts another famous villian, Bowser! Having combined their forces, Dr Wily and Bowser unleash their new destructive creations upon the Mushroom Kingdom. 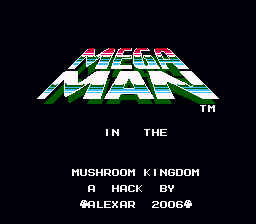 After hearing news of Wily's new plan, Mega Man decides to travel to the Mushroom Kingdom himself to stop Wily again. Mega Man now finds himself in a strange new world filled with obstacles and locales very foreign to him. Fearless, Mega Man presses on to Super Mario's old stomping grounds to defeat these new foes. 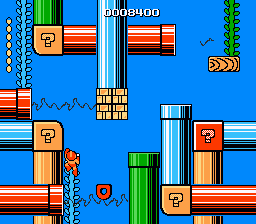 Mega Man in the MK is set in various classic Mario games. Including Super Mario Bros1, 2, 3 and World. Megaman faces off against Wily's Bosses as well as Bowser's minions. This being Super Mario's World, he gladly helps out Mega Man by increasing his jumping power as well as outfitting the Blue Bomber with some of his old garbs. * The 6 main starting levels have had extensive level design and graphics modifications. * Megaman can jump higher. * Minor title screen edit, minor text edits here and there. in place of letters in the pause/power menu. I always thought Megaman knew his shrooms. Guess I was right!